Hello! Today I have August's MeeBox to share with you. If you missed my recent look at July's 'Main Stage' box, you can find that post here. 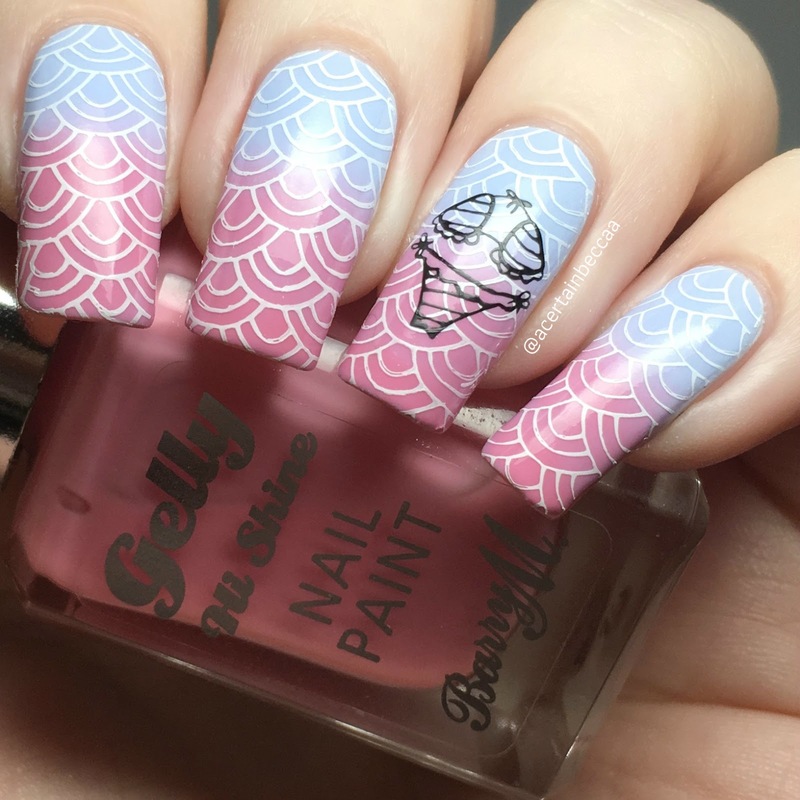 August's theme was 'Pool Party', and included four nail polishes and three nail art items. 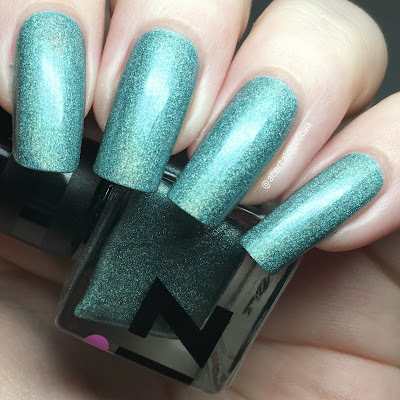 Read on for my full swatches, a look at everything inside, and some quick 'Pool Party' nail art. Unusually this month, we recieved two polishes from the same brand - iZ Beauty of London. First is 'Eternally Emerald', a greeny blue holographic. I actually already own this as I swatched it for iZ back in March (post here). I've cheated a bit and used my original swatch below. Shown is three coats with topcoat. 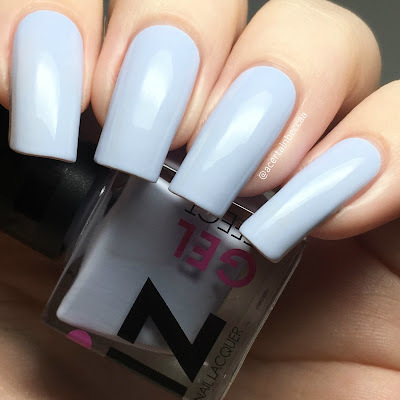 The second polish from iZ Beauty is 'Forget Me Not', described as a 'pastel power blue'. The formula is smooth and easy to apply. I did find this a bit sheer and streaky at first, though it did build up nicely. I needed a third coat to even it out fully but this might be due to my longer nails. Below is three coats with topcoat. 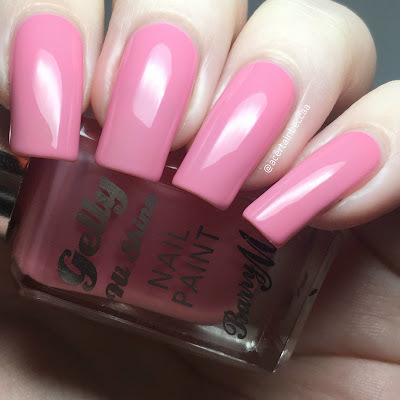 Next is Barry M Gelly 'Dragon Fruit', a soft pink creme with a very subtle shimmer. I do already own a bottle of this as well. My exisiting swatch (see here) is a bit older than 'Eternally Emerald', so I did reswatch it. It starts off on the sheer side but builds up nicely. The shimmer doesn't really translate to the nail, but it's still a very pretty pink! Below is three coats with topcoat. 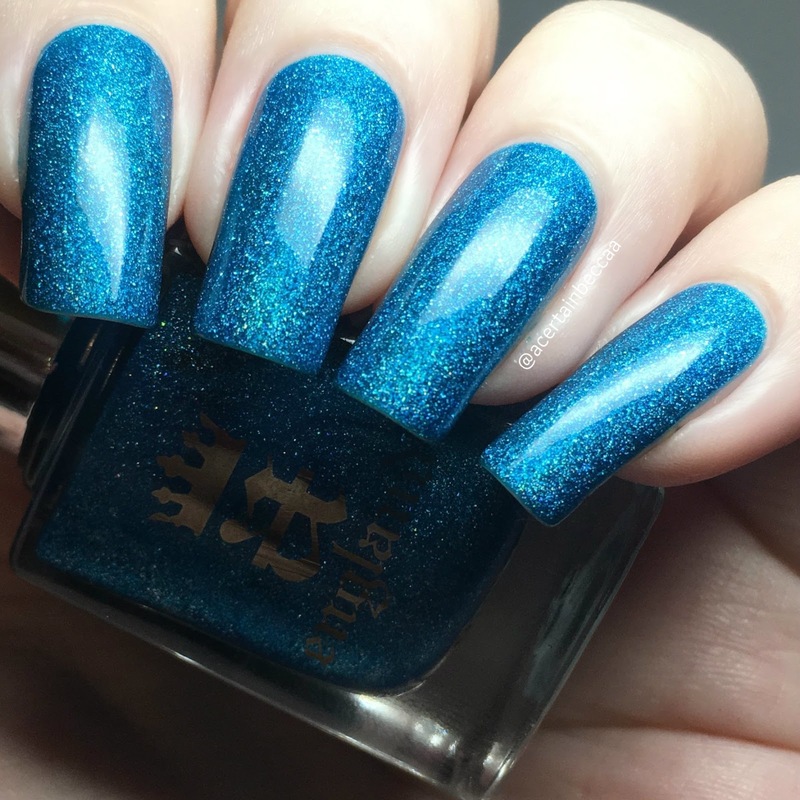 Last up for polishes is A-England 'Puck A Fairy', a bright blue holographic with added shimmer. The formula is super smooth and easy to apply. Like most A-Englands it is nicely opaque, and covers fully in two quick coats. I wore this for a few days (with base coat) and had no staining. Below is two coats with topcoat. 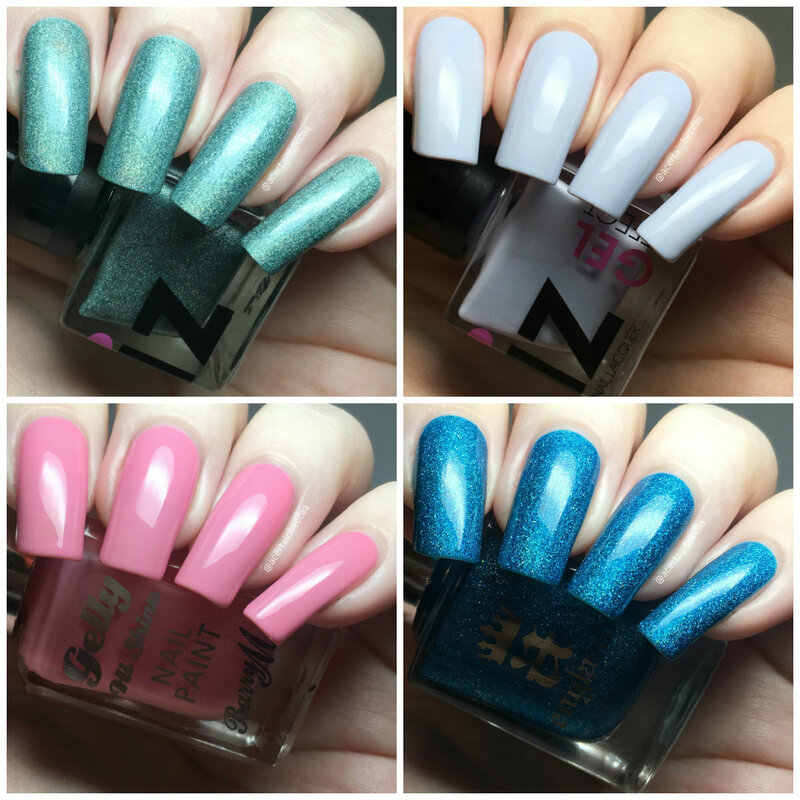 We also recieved four nail art items this month, including a set of Pool Party nail wraps from NCLA, a packet of neon hexagon glitter from Charlie's Nail Art, and both a stamping plate (Summer BPX-24) and dual ended stamper and sponge tool from Born Pretty. Mixing and matching these gives you so many options! Now for my 'Pool Party' mani. I started off with by gradienting together iZ Beauty 'Forget Me Not' and Barry M 'Dragon Fruit'. I then stamped the wave/scale pattern from the Born Pretty plate over each nail in white. To finish off, I stamped one of the bikinis onto my ring nail in black. What do you think? It might be getting a little bit cold for pool parties now, but I still like my mani. 'Forget Me Not' and 'Dragon Fruit' together make me think of those fizzy bubblegum cola bottle sweets. It's a bit unfortunate that I already had two of the four polishes for August, but that's the risk you take with these boxes - and my Mum doesn't complain if she gets my dupes!